Ouch! Does my pet have arthritis? Arthritis (also termed degenerative joint disease) is a relatively common problem in pets, particularly as they become older. The joints most susceptible to arthritis are the joints permitting limb movements; these joints are called synovial joints. The ends of the bones which meet at these joints are covered by a very smooth articular cartilage. The joints are also lubricated with synovial fluid, allowing friction free movement. Arthritis is characterised by a thinning or breakdown of the articular cartilage lining the ends of the bones in the joint. Affected joints usually appear stiff, swollen and painful. 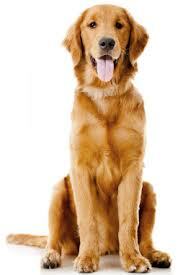 Pets are usually stiff on rising after a period of rest and may be reluctant to walk or jump onto chairs or into the car. Additionally, the signs of arthritis often are made worse by cold, damp winter weather. 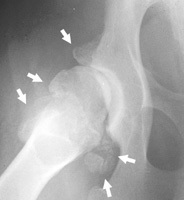 On X-Ray the new bone can often be clearly seen. There are several causes of arthritis. The commonest is a lifetime of activity, simply resulting in wear and tear on the joints. 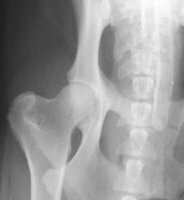 Arthritis may also occur following joint trauma, or secondary to malformation of a joint as in hip dysplasia. Although arthritis cannot usually be cured, a variety of modern treatments and exercise regimes can make life much better for affected pets. In conjunction with this, losing weight can make a real difference to your pet’s mobility. If you are concerned that your pet is showing signs of stiffness on rising or lameness, please phone and arrange an appointment to see us for a check-up.